Can I create rescue disks for any point in time? - Ask Leo! Can I create rescue disks for any point in time? You can indeed create rescue media to restore your machine to any point in time. Rather than calling it rescue media, though, it's nothing more than an image backup. Can I create rescue disks for any point in time? If there’s a problem, I don’t want to restore to the factory settings at the beginning. I want to restore to a recent time when I created rescue disks (if this is possible). I’d like to do this weekly so I don’t lose the most recent settings, program, files, etc. What you’re talking about is something I’ve long recommended: performing an image backup. An image backup is a snapshot of everything – and I mean everything – on your machine: the operating system, the programs, your data, your custom settings, and more. All of that is then put together in an image backup. It represents a snapshot of your entire machine at a point in time. You can get an image backup daily, weekly, or monthly. You can do it incrementally, so you’re not taking a complete image of the machine every time, but only updating the system, programs, files, and other things that changed since your last full backup. There are many backup options, but this sounds like exactly what you need. If anything goes wrong, you can then restore your machine to almost any point. Want to go back to the way things were last week? You can. Need to go back to the way things were a month ago? Open last month’s backup and restore that to your machine. How do I create an image backup? Fortunately, I have several articles on image backups. My recommendation is downloading a program called Macrium Reflect. It has both free and paid versions, but I actually recommend the paid version for the additional features that you get with it: skimping on a backing up is not something you want to do. I also have articles including videos on setting up your backup, automating it, and restoring from it. On top of that, I have two books Saved! – Backing Up with Windows 7 Backup ” and Saved! – Backing Up with Macrium Reflect which show you how to use both Windows-own included backup program and Macrium Reflect. But the bottom line answer to your question is a big, resounding yes. We just don’t call it a rescue disc. We call it a backup. Why do you prefer Macrium Reflect over Windows 7’s backup program? - Macrium Reflect is clearer than Windows 7, it's easier to understand what it's doing, and ultimately, I trust it more. « Previous post: Should I wait for the next edition of Windows? I was thinking of submitting this question myself, as I too have been wondering about getting malware by leaving my external drive connected. But I have a second concern that still makes me want to keep it disconnected, and it goes back to something else that Leo talks about a lot. Your computer is only as secure as who ever has physical access to it. The way I figure it, if someone breaks in and steals my computer, they are likely to take the backup drive at the same time. So I’ve just lost everything. When I’m finished with my backup, I put the external drive away on the top shelf of a closet. It’s not locked away, so it’s not terribly inconvenient. 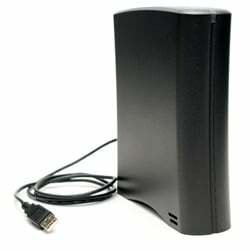 However, it does give an extra deterrent from both the computer and backup drive from being stolen.